Saka-Saka (Saca-Saca, Sakasaka, and also known as Mpondou, Mpondu, or Pondu) is the Congolese word for cassava leaves, and the name of a dish made from them. 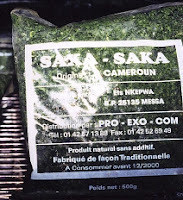 Could "saka" be a Congolese pronunciation of "cassava", doubled for an emphasis on quantity to name a dish wherein cassava leaves are the main ingredient? Central African people seem to be unique in their consumption of cassava leaves, which are cooked as greens. Elsewhere in the world, the cassava (or manioc, yuca, or yucca) plant is cultivated only for its tubers. Cassava leaves are found only in the tropics. If you can pick your own fresh cassava leaves, select the smaller, newer leaves; the larger, older ones are tough. If cassava leaves are not available, substitute collards, kale, turnip greens, or similar. Lots of cassava greens (feuilles de manioc) [or substitute kale, collards, turnip greens, spinach, or similar], stems removed, cleaned, and cut or torn into pieces a few spoonfuls of palm oil, Moambé Sauce, or any oil one onion, chopped one clove garlic, minced sweet green pepper and/or sweet red pepper, chopped (optional) eggplant (peeled, cubed, rinsed, and salted) or okra, chopped (optional) salt, or baking soda, to taste one piece of dried, salted, smoked fish, one can of pilchards or one can of sardines. Bring a large pot of water to a boil; add greens and cook for thirty minutes or more (much more if using cassava leaves). Add all the remaining ingredients to the greens and bring to a boil, then reduce heat and simmer. Do not stir. Simmer until the water is mostly gone and the greens are cooked to a pulp. Serve as a side with a chicken, meat, or fish main course, with Baton de Manioc / Chikwangue, or Rice. Many Central African cooks use baking soda, or a piece of rough potash, to give a salty flavor to soups and sauces. This replicates the flavor of traditional salts which are obtained by burning the barks or leaves of certain plants. This was necessary because there is no other source of salt in much of Central Africa.